Detroit‘s Miguel Cabrera and Pittsburgh’s Andrew McCutcheon were selected as the A.L. and N.L. MVPs for the 2013 baseball season. How well do you know trivia about MLB’s most valuable players? Take this quick quiz. Answers appear at the end of the column. 1. Since 1983 there have been 16 occasions when the league MVP and the Manager of the Year came from the same team. It has not, however, happened since 2001. Can you name the player and manager from the same team that won those honors in 2001? Hint: The team was the Seattle Mariners. Can you name the National League player and manager from the same team that won those honors last in the N.L. (it happened in 2000). Hint: The team was the San Francisco Giants. 2. Both of this year’s MVPs did not see their team advance to the World Series. Name the last year that the A.L. and N.L. MVPs also appeared in the World Series that season. 3. With Cabrera winning the A.L. MVP this year, it was the third consecutive year that a Detroit Tiger won the award (Cabrera won in 2012 and Tigers pitcher Justin Verlander was the A.L. MVP in 2011.) Since the beginning of the MVP awards, the MVP has come from the same team in three (or more) consecutive years nine times. The 1975-77 Cincinnati Reds were one of those teams. Here’s the question: From 1970-77, a player from the Reds won the N.L. MVP six times in those eight years. Can you name the four Reds players who won an N.L. MVP from 1970-77? 4. Cabrera this season became the 30th player in MLB history to win the MVP more than once. Of those 30 players, 22 are currently in the Hall of Fame, three (Alex Rodriguez, Albert Pujols and Cabrera) are still active players. Can you name the remaining five players who won multiple MVP awards who are not in baseball’s Hall of Fame? 5. Since 1970 only five catchers have won a league MVP. Name the five. 6. Going back to 1990, there are nine current MLB franchises that have not had one of their players win a league MVP. Can you name those nine teams? 1. Seattle Mariners manager Lou Piniella and player Ichiro Suzuki won the honors in the A.L. in 2001. Giant’s manager Dusty Baker and infielder Jeff Kent were the N.L. honorees in 2000. 2. The last time the league MVPs squared off in the World Series was in 2012 when the Giants faced the Tigers. Giants’ catcher Buster Posey was the N.L. 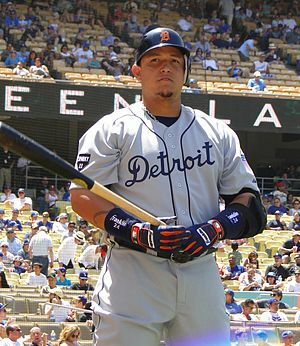 MVP; Detroit’s Miguel Cabrera was the 2012 A.L. MVP. 3. The four Cincinnati Reds players who won N.L. MVP honors from 1970-1977 were: Johnny Bench (1970, 1972), Pete Rose (1973), Joe Morgan (1975, 1976) and George Foster (1977). 4, The five multiple MVP winners (non-active players) who are not in the Hall of Fame are Barry Bonds, Juan Gonzalez, Roger Maris, Dale Murphy and Frank Thomas. 5. The five catchers selected as league MVPs since 1970 are Johnny Bench (1970, 1972), Thurman Munson (1976), Ivan Rodriguez (1999), Joe Mauer (2009) and Buster Posey (2012). 6. The nine teams/franchises that have not had a league MVP since 1990: Arizona, Cleveland, Kansas City, L.A. Dodgers, Miami, N.Y. Mets, Tampa Bay, Toronto and Washington.